It would be hard to deny that 2011 was the year of humongous eye candy TVs. Everywhere you look, you can find all sorts of tantalizing TV sets. As for 2012, it does not seem as if the winds are blowing in a different direction. As early as the first week of the year, we are already hearing about new TVs that will wow everyone. Even those who may not normally be into the high end devices. According to 9 to 5 Mac ((9 to 5 Mac)), LG has announced the mother of all HDTVs: the LG 55-inch OLED. This baby is going to be unveiled during this year’s Consumer Electronic Show (CES), and it boasts of what might very well be the sleekest design for TVs in its range. If one look at the LG 55-inch OLED TV is not enough to convince you, how about the fact that it is only 4 mm thick? Or rather, thin! As for the weight, the TV only weighs 7.5 kg. The LG 55-inch OLED TV is not all about the size and weight, though. 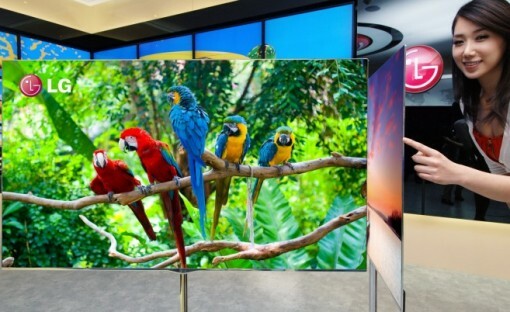 Using technologies such as “4-Color Pixels”, “Color Refiner”, OLED panels, and the company’s different manufacturing processes, the display offers natural and accurate colors – more accurate than today’s LCD and LED TVs can provide. If you are a sucker for these details, then you will certainly appreciate what LG has done. The OLED TV also boasts of an infinite contrast ratio, which basically means that you will see the tiniest details on screen, no matter what the “overall luminance of the on-screen image”. Here’s the best thing: the price point is supposed to be much lower than what we would expect if the standard manufacturing process were followed. While it can be expected that the LG 55-inch OLED TV will cost you some, we can only hope that it will not ask you to give up an arm and a leg. One thing is for sure: this TV will make eyes pop out and mouths water. Now actually buying it is a totally different matter!